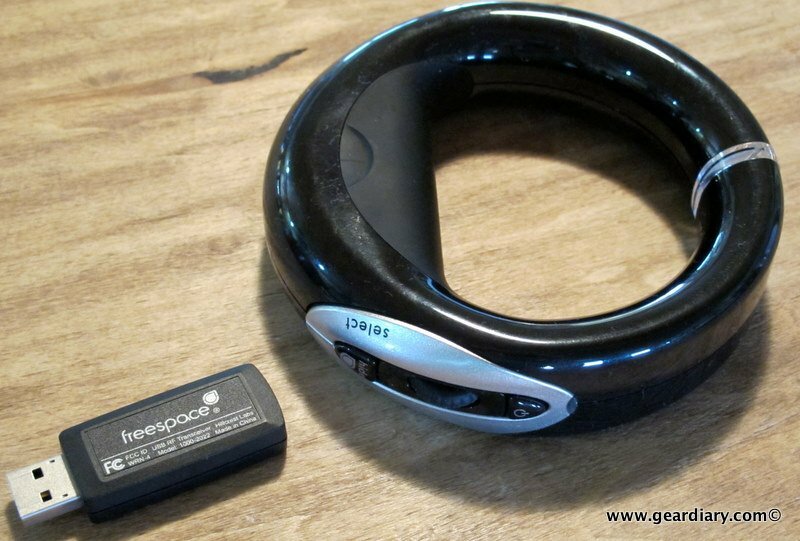 It never failed that when someone would visit while I was testing the Hillcrest Loop pointer, they would invariably pick it up and wear it like it was an over-sized bangle — because at first glance, that is exactly what it resembles. But the Loop is much more than just a piece of giant plastic jewelry. 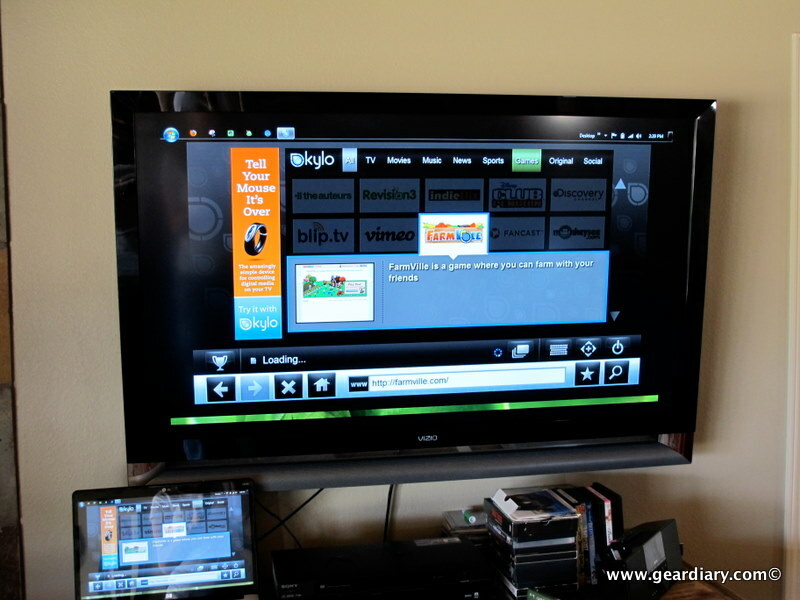 The Loop pointer actually got its start as an “iconic concept product to showcase Hillcrest Lab’s Freespace technology and HoME system solutions.” People who saw it liked it, and they wanted one; so Hillcrest, whose primary focus remains “licensing interactive media systems software for TV” decided to make it available for purchase. 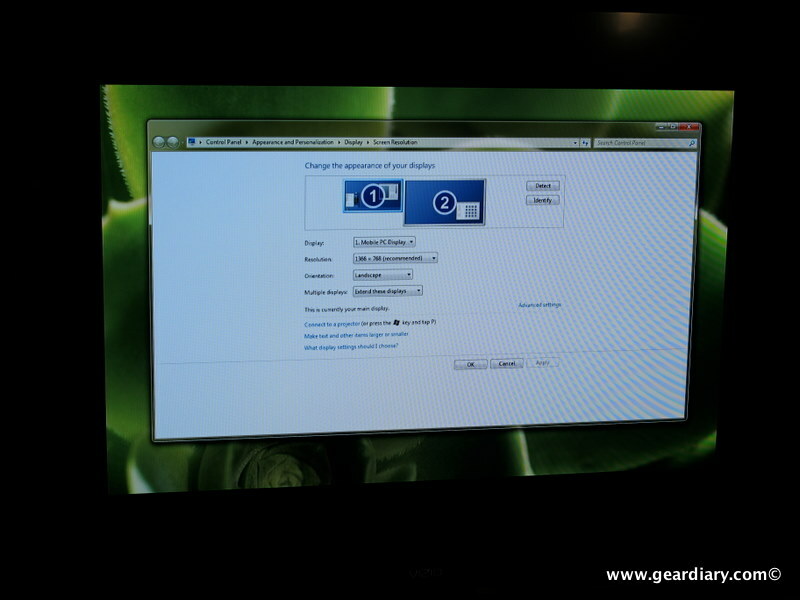 I got to see the Loop pointer in action at CES, where Hillcrest Labs had a PC hooked up to a TV; they were using the Loop pointer to control the laptop, which in turn controlled the image shown on the TV screen. The idea was pretty intriguing, but I wanted to give it a try on my TV; fortunately Hillcrest Labs was willing to send me a loaner. Included in the box are the Loop pointer remote control, a USB RF transceiver that plugs into your PC, Mac or PS3™, two AA batteries, and a user guide. 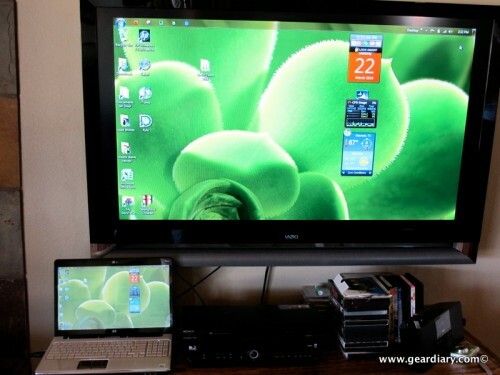 Not included is the HDMI cable that will be needed to attach the PC, Mac or Play Station3 to the computer. The Loop pointer is a futuristic styled bagel of a mouse; it is meant to be held in either the right or left hand, and its controls are similar to what most people are used to seeing on a regular computer’s mouse. 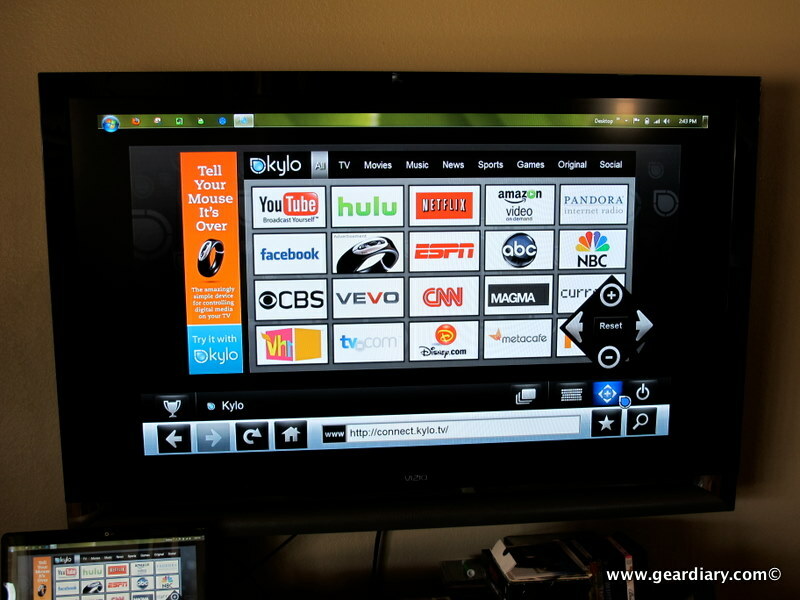 At the very top of the button array there is a status LED, with a power button and then scroll-wheel directly under. 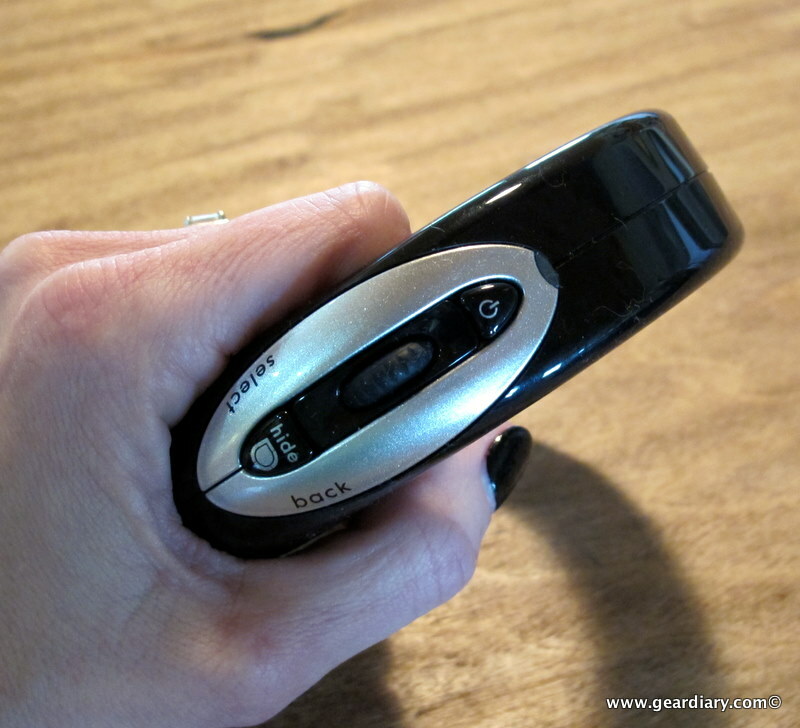 The button on the left, labeled Select, functions just as a left click on a mouse would – – for instance, it can be used to select and highlight text. The button on the right, labeled Back, is used just like the right click on a mouse; pressing it opens up the on-screen right-click menu appropriate for the item being viewed. At the bottom there is a Hide button, which doesn’t exactly hide the cursor — instead it freezes it in place, so that if you are holding the loop or walking with it (during a presentation for instance) the cursor won’t be a distraction by jumping around onscreen. 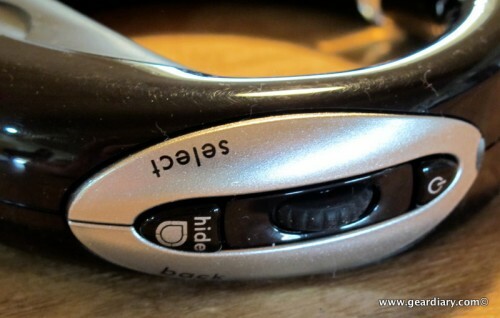 Clicking the hide button when you are ready to use the pointer again will unlock it. The Loop pointer is composed of shiny black plastic accented with gray buttons and a single clear plastic strip at its base. The battery compartment/grip is coated in a rubbery material, similar to that found on mobile phones. 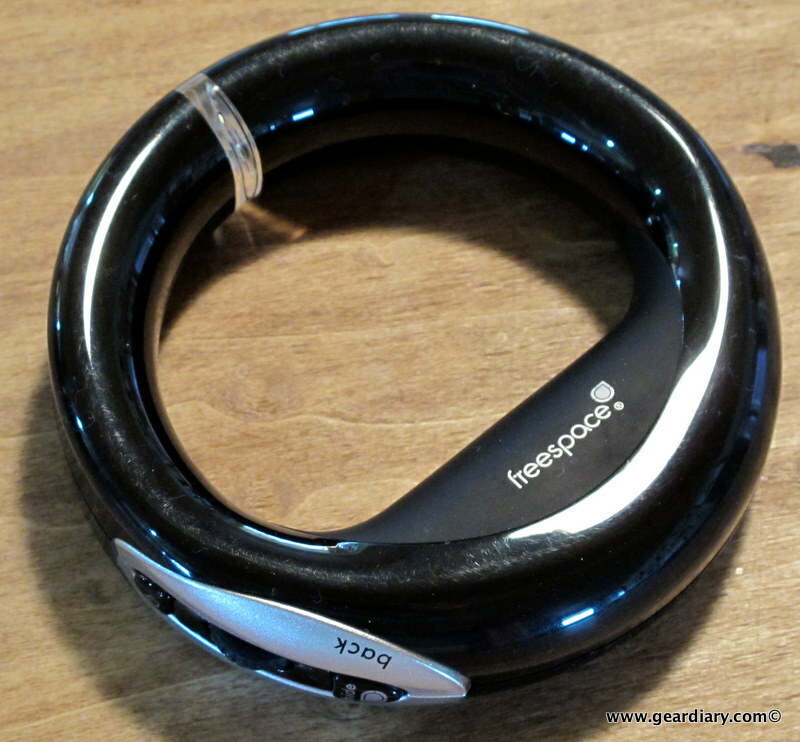 The Loop measures approximately 5″ across x 1.25″ thick, and it weighs almost 5 ounces. 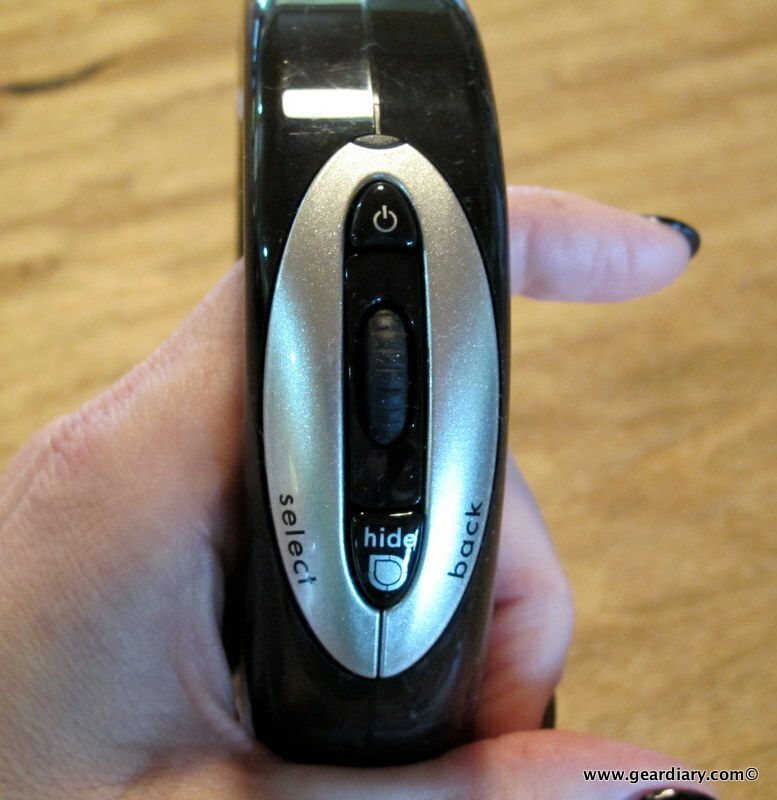 Two included AA batteries go inside the battery compartment which also functions as a grip. Setting up the Loop is a simple two-step process. First, you plug the USB dongle into a free port on the host computer. 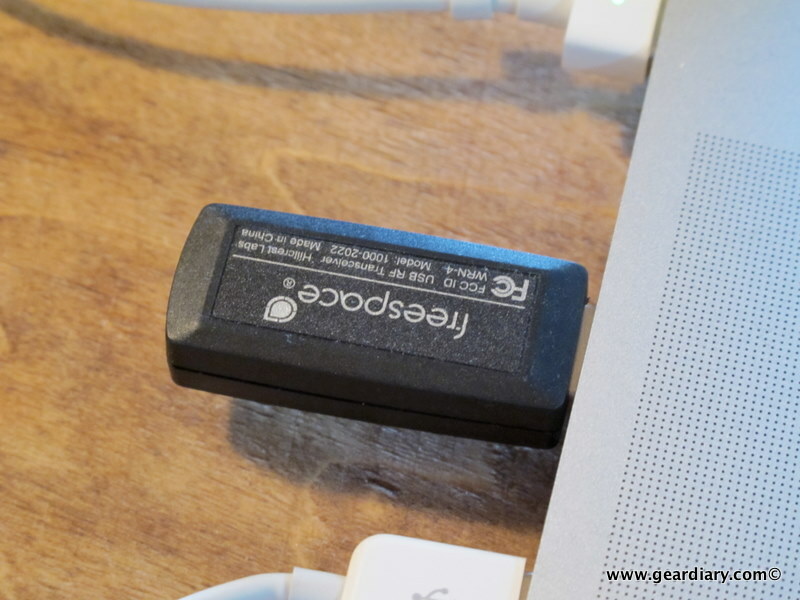 The dongle is actually an antenna with a built-in radio frequency transceiver. On a Mac, there is no setup needed to get the Loop to properly function as a mouse. On a PC, you may need to update or install drivers. 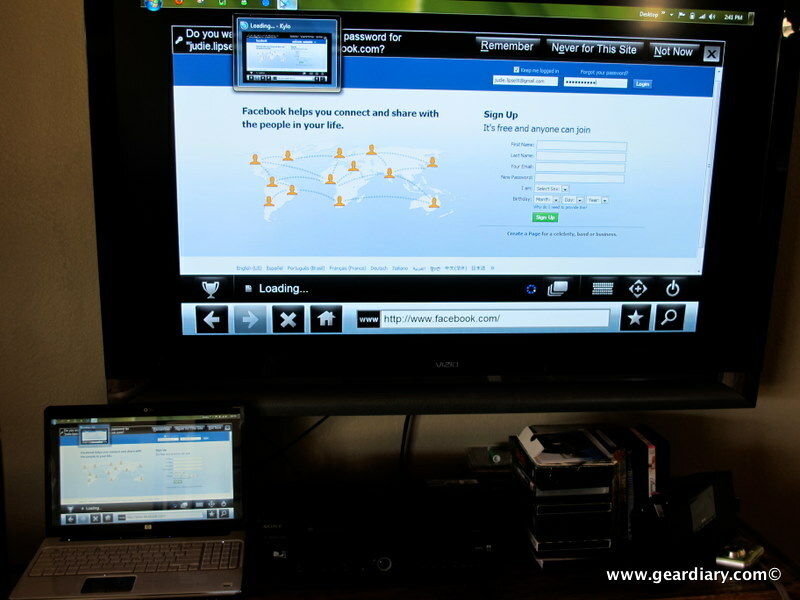 If you are doing a presentation using your laptop and a projector system, that is all that will be needed. 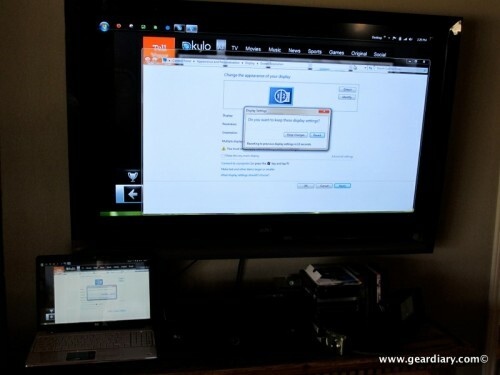 If you want to view your laptop screen on a television, the next step will be making a connection between the computer (or PS3) and TV. 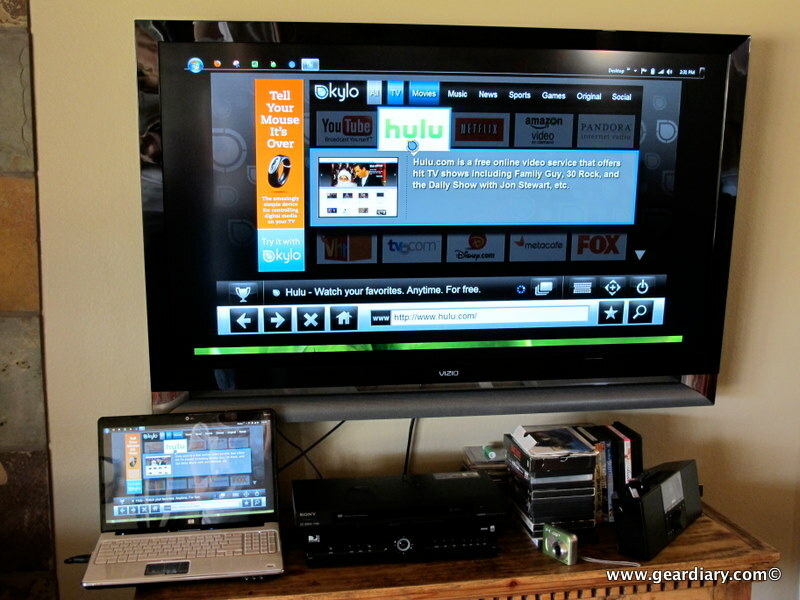 Many PCs and laptops (other than Macs) come with HDMI ports, and Hillcrest Labs says that is the best option for connection to an HDTV. “Macs do not have HDMI outputs, but some have DVI outputs (such as DisplayPort), and these can be used with adapters to HDMI cables.” Since my HP dv6 has an HDMI port and I happened to have an extra set of HDMI cables, I opted to use that laptop to drive our TV. 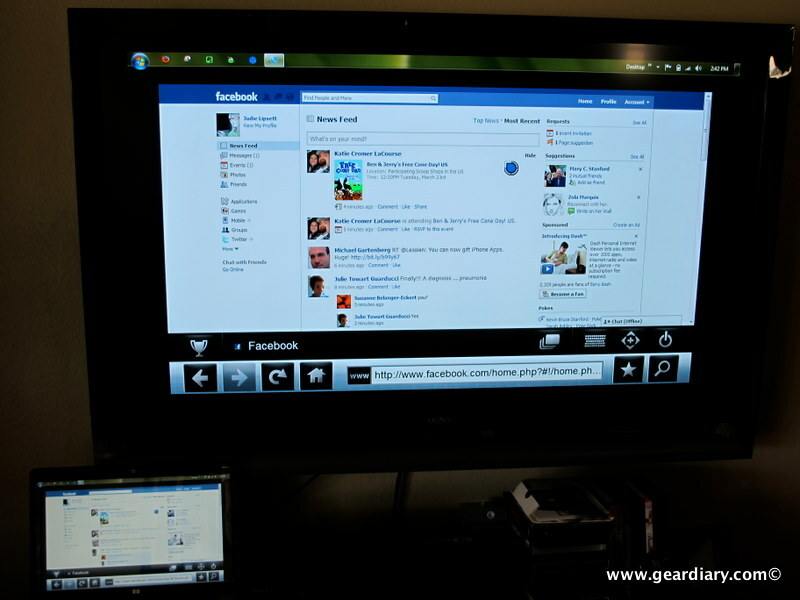 I should mention that setup between a laptop and TV using HDMI cables is so simple that anyone can do it, even the most technically challenged. One thing you will likely run into (at least on Windows machines is the dual-screen issue, in other words – your computer will be showing one thing and the TV another. 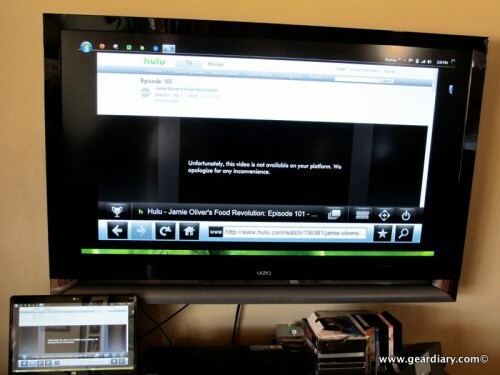 All you have to do in this situation is instruct the computer to show the same thing on both screens, and then you’ll be up and running. 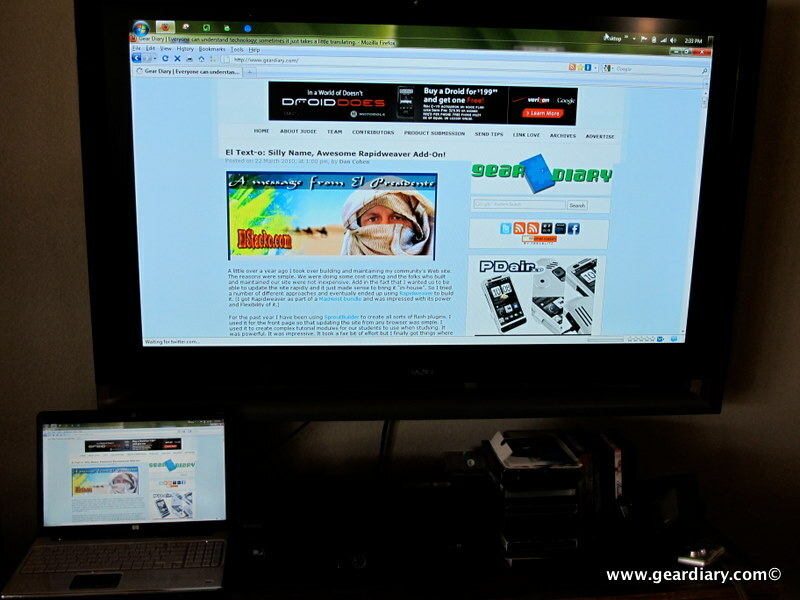 Once the PC and TV are connected and you’ve got your screens squared away (or even if you are using only the mouse and laptop combination), you’ll probably want to practice using the Loop pointer for just a bit. The main things to remember are that you should hold the Loop so that your four fingers are resting on the grip, with your thumb free to press whatever buttons are necessary. You don’t need to make broad sweeping hand or arm movements; instead, you should concentrate on gentle wrist flicks, which are literally all it takes. If you get off-track and the pointer is oddly placed in relation to the way you are holding it, gently shaking your wrist will bring the pointer / cursor back in line. 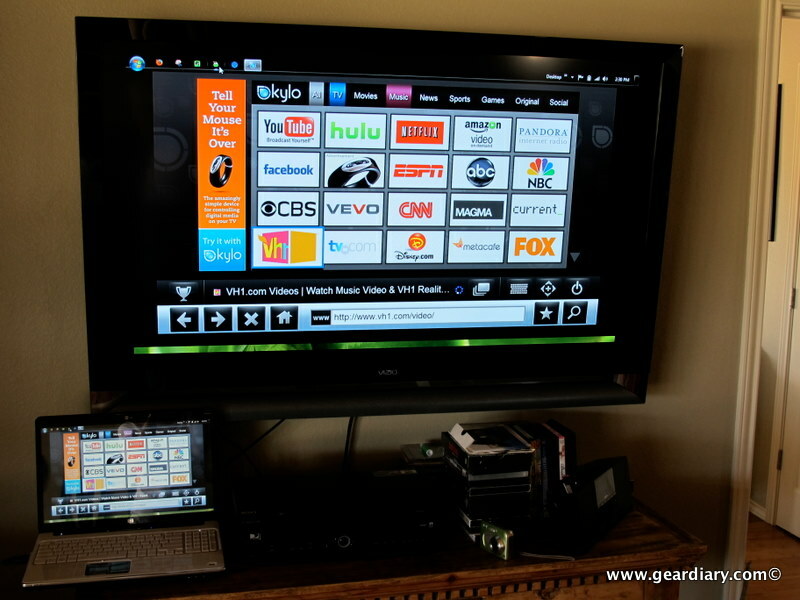 In just a few minutes, you will be navigating your laptop on your TV screen like a pro. 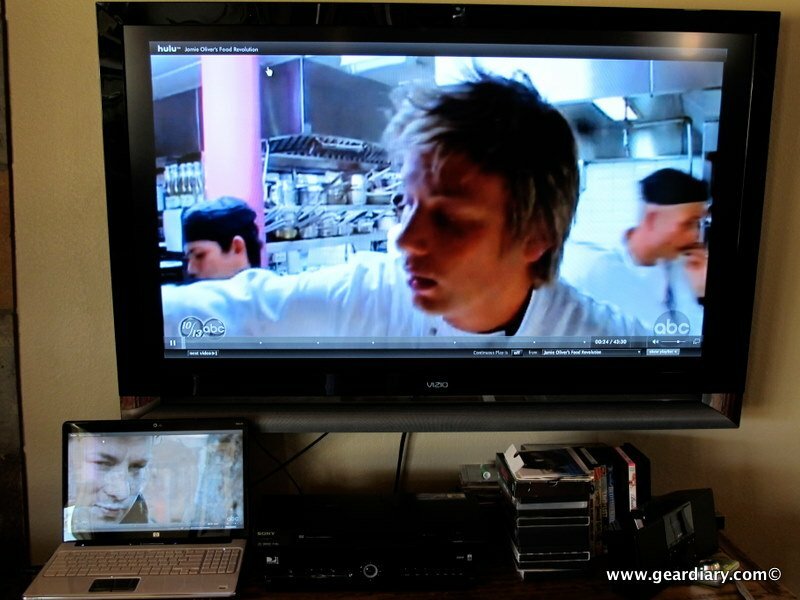 Worth noting is that you do not have to aim the Loop pointer at the laptop to get the cursor to appear in the proper position on the TV screen; in fact, if your laptop supports media playback with the lid closed, you can still control the laptop with the Loop, laptop lid down. 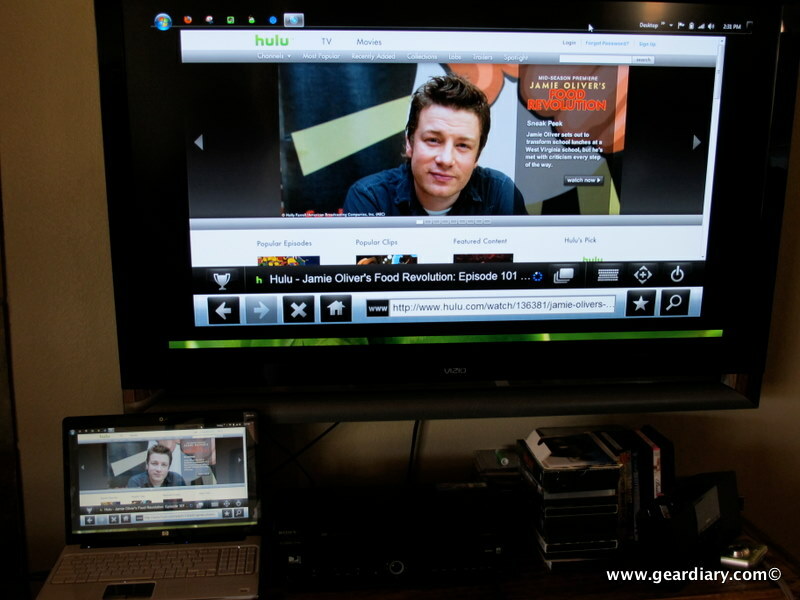 If you are interested in using your newly connected TV as more than just a means to watch Hulu and YouTube videos and you’d like more of a full computer browsing experience, then you might want to add a wireless keyboard versus using the onscreen keyboards offered by Mac and Windows. 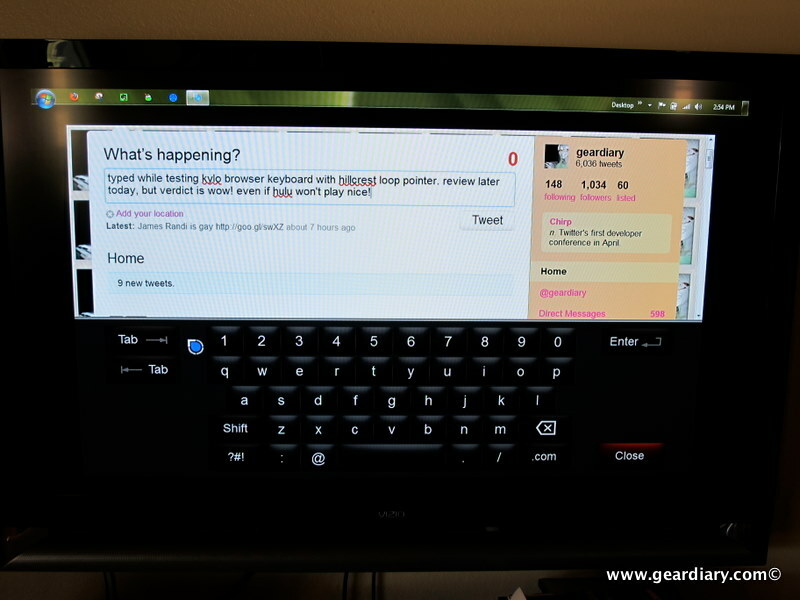 These OS keyboards work well enough, but they seem more suited to tapping with a finger or stylus than using a “mouse” to tap in the characters. With that said, I was already very impressed with the Loop pointer and its capabilities and was seriously considering ordering one for myself, but something happened today that has pushed me to order. 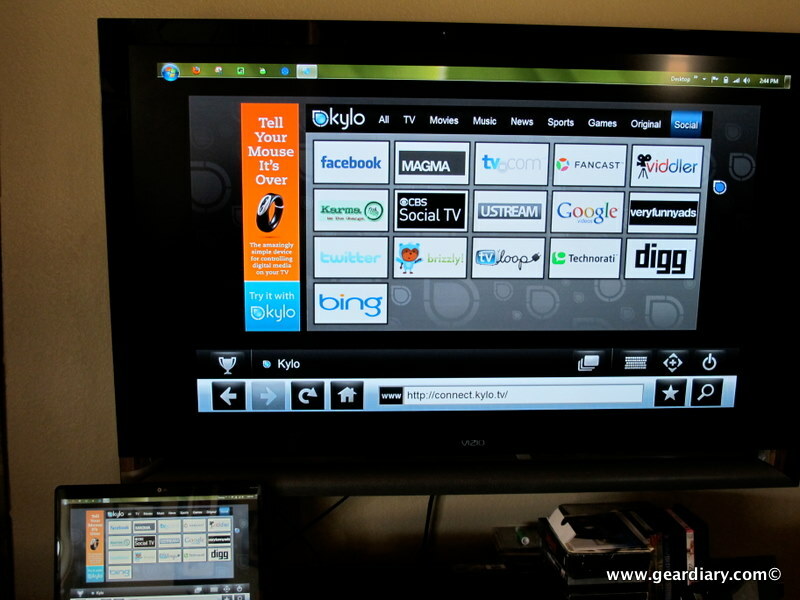 As of today, you can further improve your TV browsing experience by downloading and installing Hillcrest Labs’ Mozilla-based Kylo TV browser. 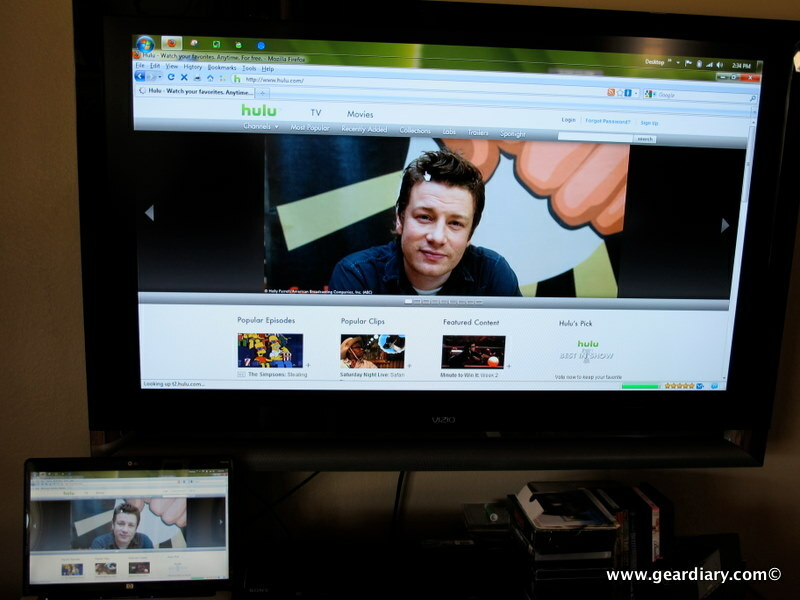 Hillcrest Labs bills it as “the browser built for television,” and that is no joke. 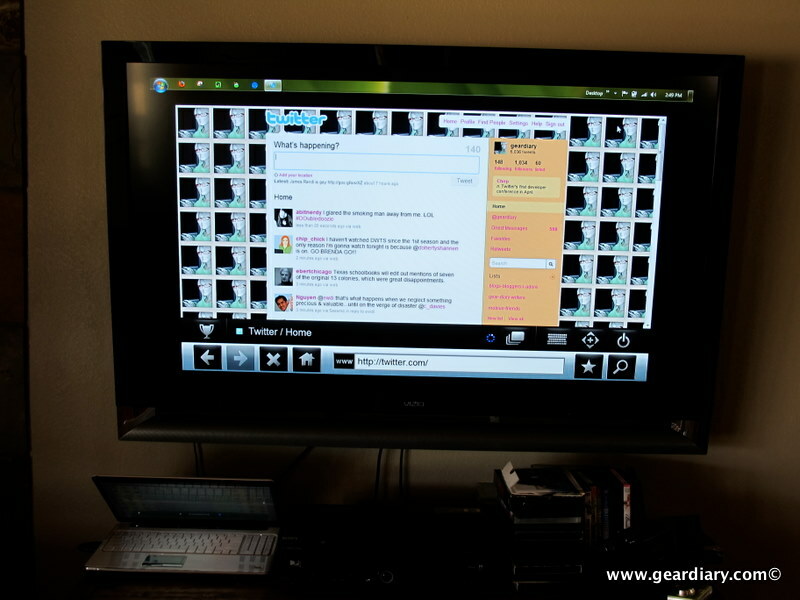 Kylo is optimized to look better and be easier to navigate than other browsers when viewed on a large screen from across the room. 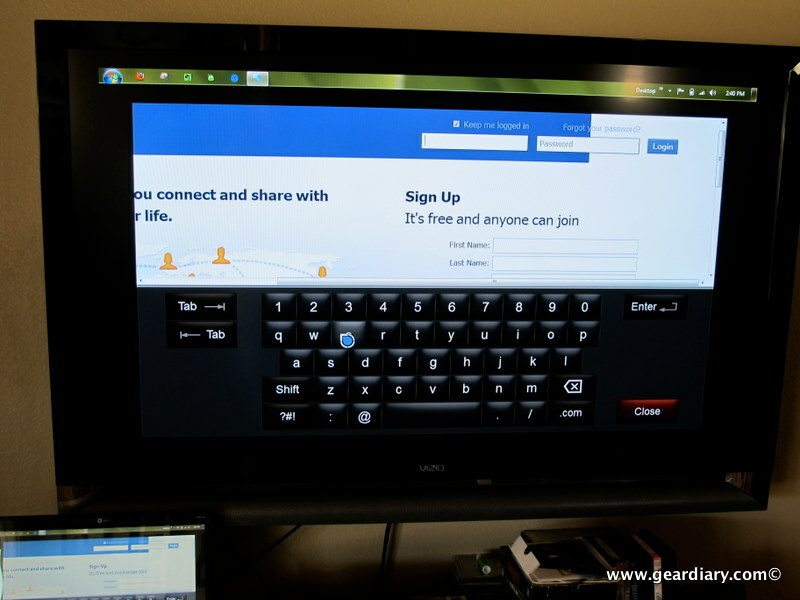 The Kylo browser is not meant to replace traditional browsers such as Internet Explorer(R), Safari(R), or Firefox(R) for use with standard computer display screens, but instead is for use on a television connected to a computer. 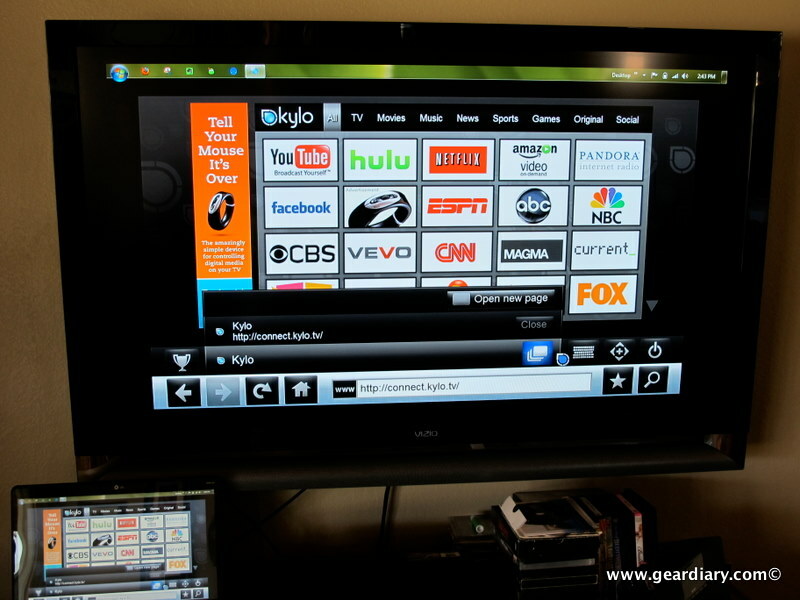 Unlike other applications or Web sites, Kylo is not a “walled garden” of aggregated video content, but rather a true Web browser that lets users go where they want across the Internet. 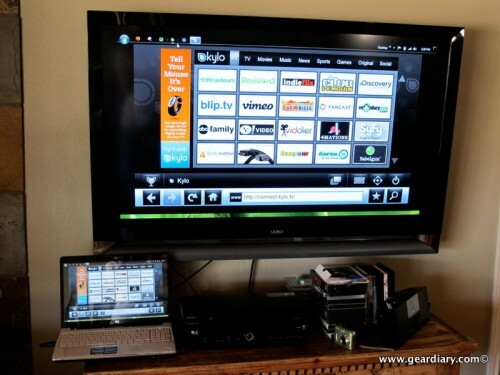 * free, easy download and setup. 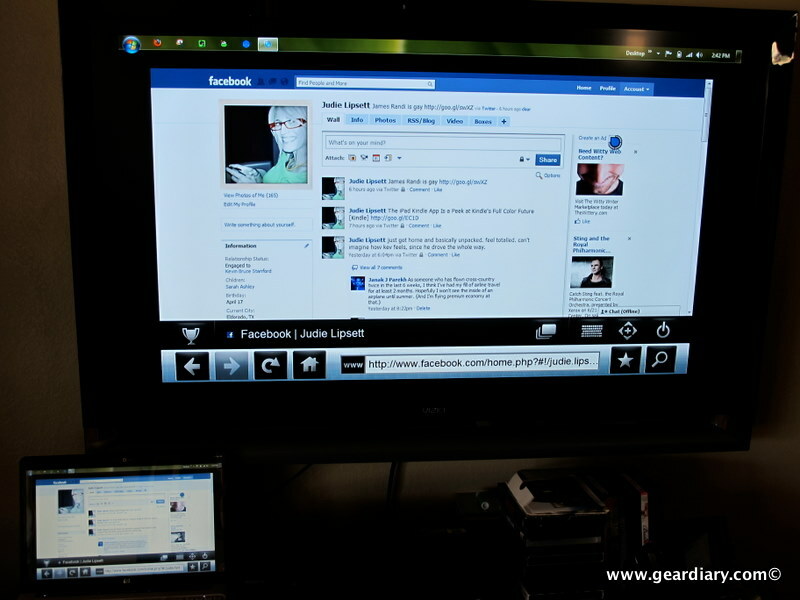 Our TV is 55″, and I can sit on the couch across the room and easily punch the large Kylo home screen buttons to go directly to favorite sites, or I can navigate using the large on-screen Loop optimized buttons and pointer/cursor. 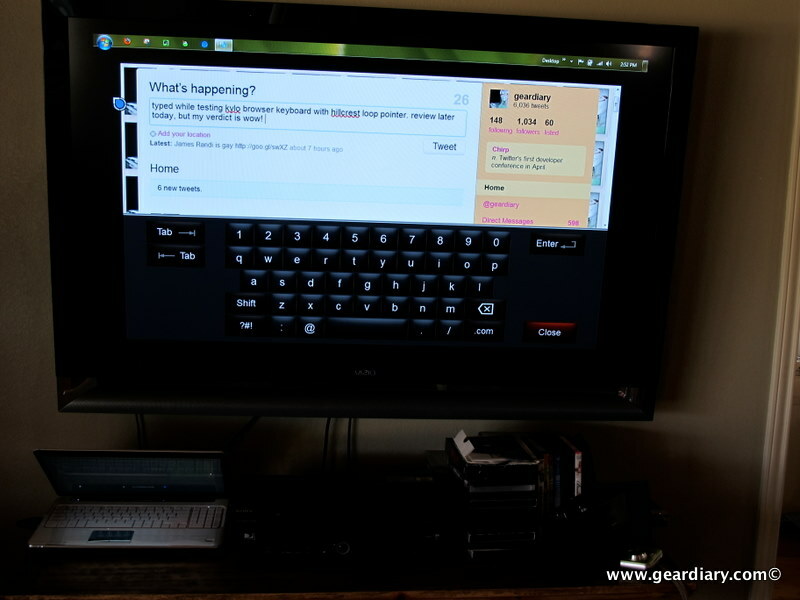 Without Kylo, the Hillcrest Labs Loop pointer was already an ingenious way to surf your laptop from a big screen TV; with Kylo, accessing online content has just become second nature to my television. 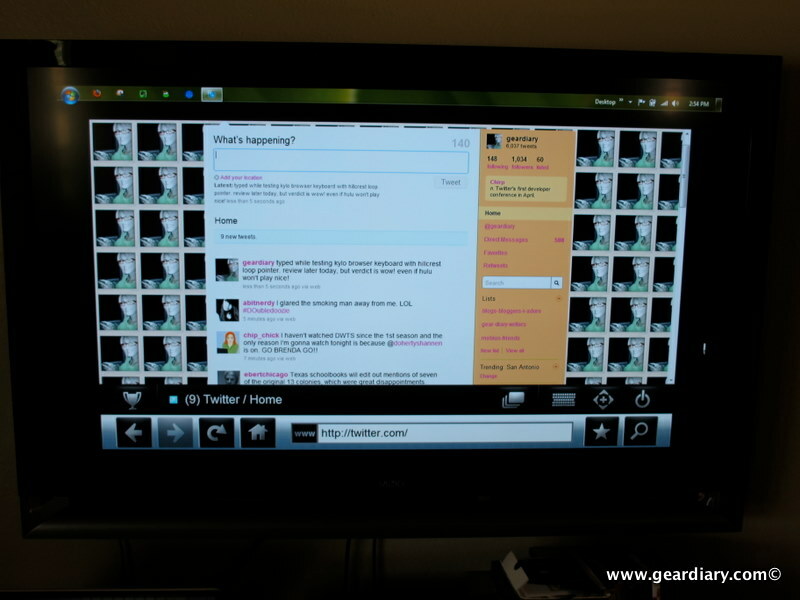 The Loop pointer + Kylo TV browser = absolutely brilliant! 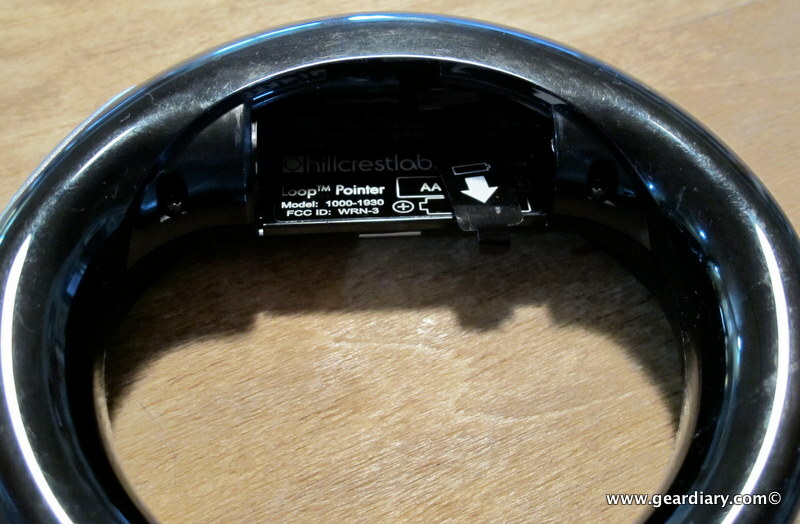 The Hillcrest Labs Loop Pointer is available directly from the manufacturer and from other retailers. 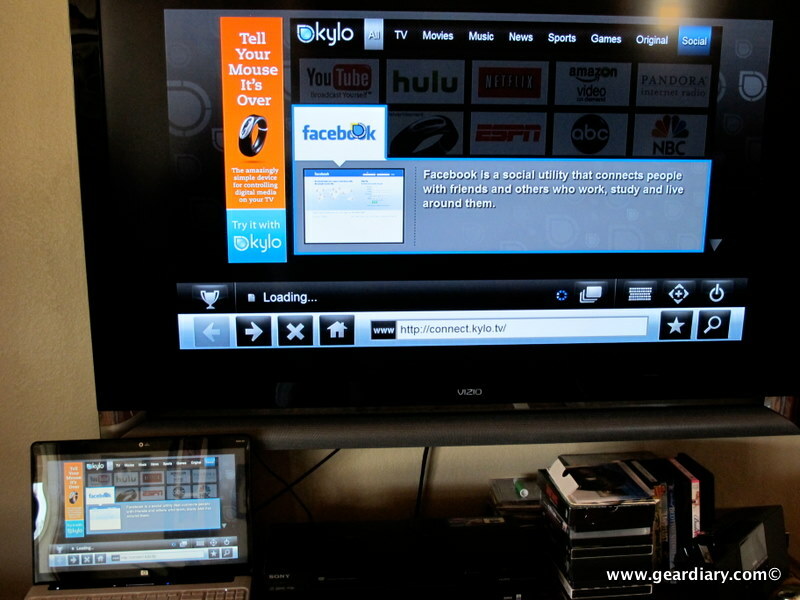 Kylo TV browser is available for free directly from the Kylo Browser site. 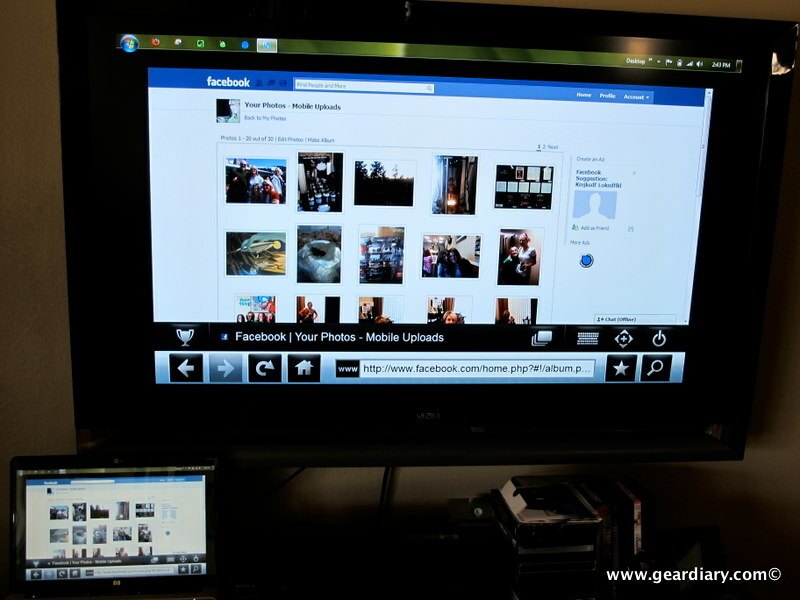 What Needs Improvement: Nothing — this is the best PC to TV solution I have seen, and the surfing experience is excellent!